There are six main trims to the 2018 Chrysler Pacifica: L, LX, Touring Plus, Touring L, Touring L Plus and Limited. Seven-passenger seating is standard, but eight-passenger is available on most trims. Every Pacifica has a 3.6-liter V6 engine that produces 287 horsepower and 262 lb-ft of torque. There is front-wheel drive and a nine-speed automatic transmission. 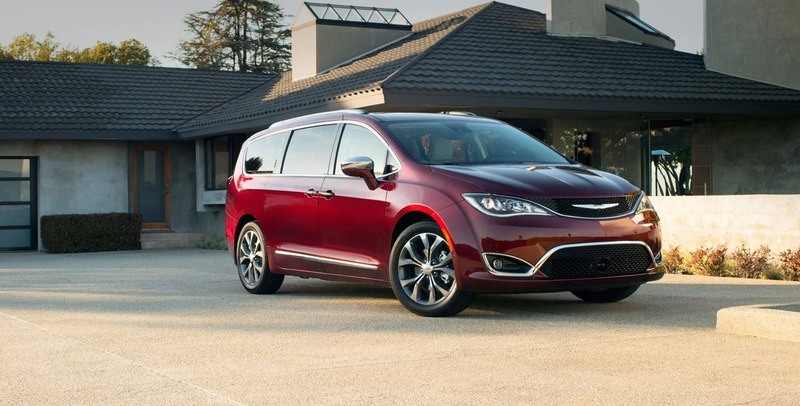 Continue reading to learn more about the 2018 Chrysler Pacifica's different trims! The L has keyless entry for the driver, heated mirrors, 17-inch steel wheels, keyless ignition, rear parking sensors and a rearview mirror. Also expect to have blind-spot monitoring, rear cross-traffic alert, a height-adjustable driver seat, dual-zone climate control and a 60/40-split folding third-row seat. There is a seven-inch touchscreen infotainment system, Bluetooth, Apple CarPlay and Android Auto, and a six-speaker sound system with an auxiliary jack and a USB port. For an additional cost you can get tri-zone climate control. The LX gets body-colored exterior trim, alloy wheels, an engine stop-start system, a driver information display, tri-zone climate control, an eight-way power driver seat and folding/collapsible Stow 'n Go seats. The Touring Plus adds chrome exterior trim, LED tail lights, automatic headlights, fog lights, power-sliding rear doors, remote engine start and full keyless entry. There is also a charge-only USB port in the front row, satellite radio, a power liftgate and automatic climate control. This trim may be had with hands-free operation for the sliding rear doors and liftgate, a 20-speaker Harman Kardon sound system and the Advanced SafetyTec package. The Touring L's standard features include leather upholstery, heated front seats, an eight-way power passenger seat, second- and third-row sunshades and a second-row USB port. An available Alpine Sound package adds a third-row USB port, an 8.4-inch touchscreen, HD radio and a 13-speaker audio system. There is also an attainable Advanced SafetyTec package that includes a sound-reducing windshield, front parking sensors, automatic high beam control, adaptive cruise control, lane departure warning, a large driver information display, a parking camera and an automated parking system. If you get the Touring L Plus then you will get the sound-reducing windshield and driver information display that the Touring L has. The Touring L Plus also has two sunroofs (the first two rows have a panoramic sunroof while the third row has a fixed sunroof), heated seats for the second row, a heated steering wheel, the Alpine audio system, navigation, an 8.4-inch touchscreen and ambient lighting. The Limited is the top dog and it has xenon headlights, 18-inch wheels, LED foglights, power-folding mirrors and auto-dimming rearview and exterior mirrors. There is also a power-folding third-row seat, an in-vehicle vacuum cleaner, the hands-free liftgate and sliding doors, premium leather upholstery, ventilated front seats, power-folding mirrors and driver memory settings. Even though you may think that the Limited could not offer more, it does! It may be had with an Advanced SafetyTec package, an updated rear entertainment system, and more! Come down to Lustine Chrysler Dodge Jeep Ram at your convenience to check out the 2018 Chrysler Pacifica! Click here to check out all our new inventory online!